Who needs gold when real growth is picking up? 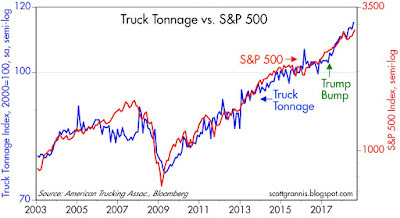 The nations' extensive fleet of trucks has hauled almost 8% more tonnage in year ending July '18. 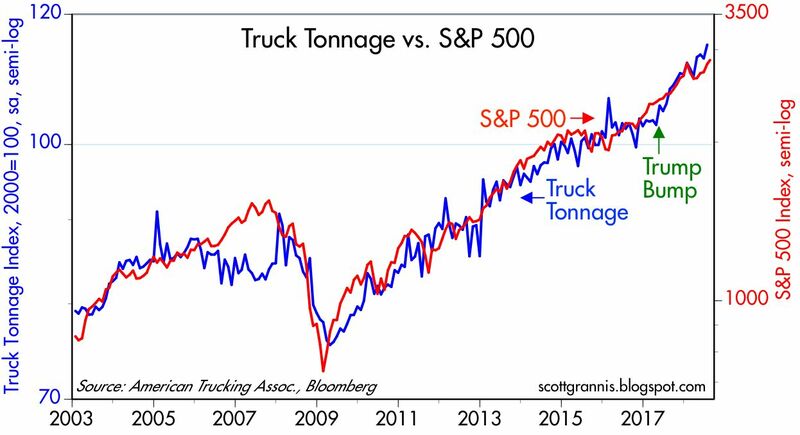 Since just before the November 2016 election, truck tonnage is up 15%. This is powerful evidence that the physical economy is expanding, and at an impressive rate. 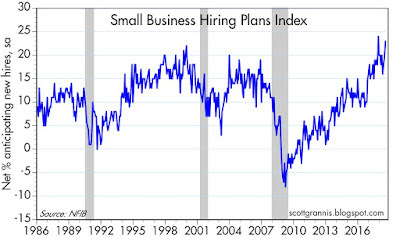 Meanwhile, I see and hear more and more evidence of a pickup in business investment. My brother-in-law is in the midst of significantly expanding his fleet of trucks to handle new business, and he is scrambling to get it done before immediate expensing expires. Incentives DO matter to business. 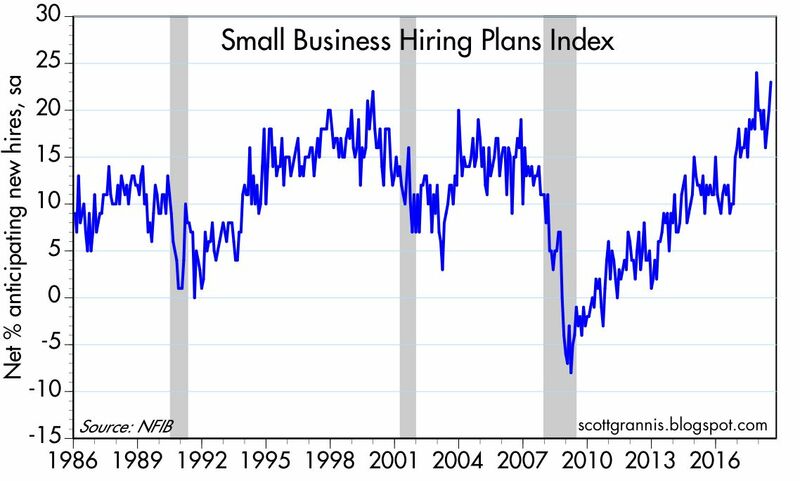 Businesses are ramping up investment, and we should see increasing evidence of this in the months to come. UPDATE (Aug 24): More signs of increasing business investment. 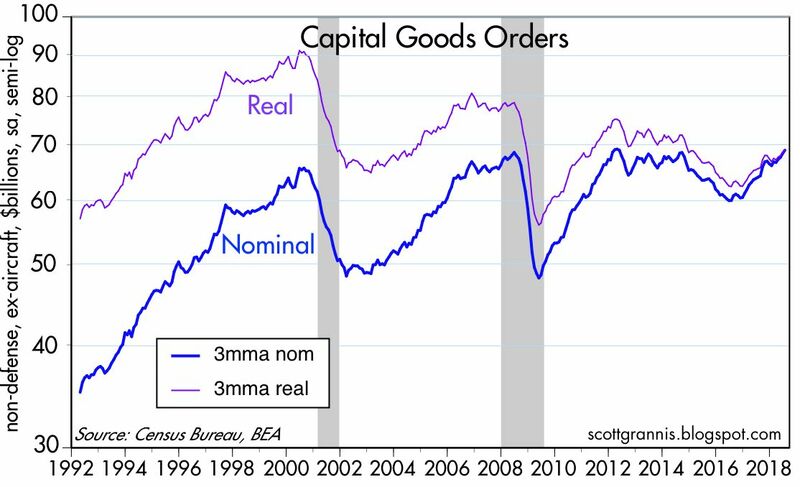 Chart #2 shows capital goods orders, which are a direct indicator of business investment. Orders are up 15% since the end of 2016, likely boosted by tax reform, after declining over the previous four years. Orders are up 8% in the year ending July '18. (Note: I'm using a 3-mo. 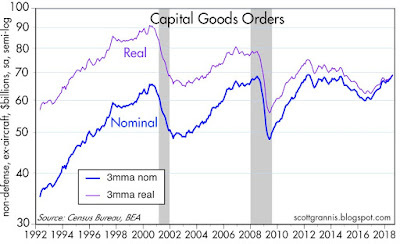 moving average for capex orders in the chart in order to correct for what appears to be faulty seasonal adjustment. The percentage changes referred to above are based on monthly data.) I would add that while nominal orders have been rising at a fairly impressive rate of late, they are still down significantly in real terms compared to where they were in the early 2000s. 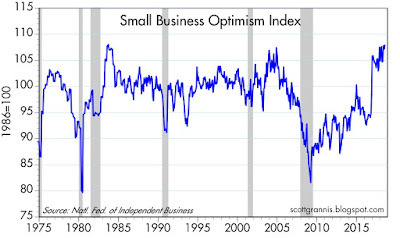 What this means is that business investment has been rather tepid in the past 18 years, and that is undoubtedly one of the reasons the economy experienced a weak recovery following the 2008-9 recession. For years I've had fun at cocktail parties by asking this question: what percent of all the people who work in the U.S. are paid minimum wage or less? Of the hundreds of people I've asked, only one has come even close to the right answer. The great majority of the answers I've received (try it yourself!) range from 10% to as much as 50%. My conclusion: A huge number of Americans hold the fantasy belief that a significant percentage of those who work would benefit from raising the minimum wage. Fact: only 0.5% of those who work take home minimum wage or less. The facts can be found in a BLS publication from earlier this year: Characteristics of Minimum Wage Workers, 2017. According to the BLS establishment survey, there were 147 million people employed in 2017 (those paid by the hour plus those who received a salary), so the percentage of all the people working who were making minimum wage or less was 1.8 /147 = 1.2%. Furthermore, according to the BLS, some 1.3 million of all those who work in the U.S. made less than the minimum wage. In percentage terms, a bit less than 1% (1.3/147) of those who worked in 2017 made less than minimum wage. But here's where it gets really interesting: "The industry with the highest percentage of workers earning hourly wages at or below the federal minimum wage was leisure and hospitality (11 percent). About three-fifths of all workers paid at or below the federal minimum wage were employed in this industry, almost entirely in restaurants and other food services. For many of these workers, tips may supplement the hourly wages received." If we assume that the vast majority of those who worked in the restaurant and food service industry (10 million) actually took home at more than the minimum wage (thanks to tips), then in 2017 there effectively were only about 700 thousand people (0.5% of all workers) who actually took home minimum wage or less. Big, under-reported fact: in all likelihood, 99.5% of those who worked in 1017 took home more than the minimum wage for their efforts, and without any help from government fiats. So the next time you're at a cocktail party, ask the person next to you to guess the percentage of U.S. workers that earn minimum wage or less. You won't be lying when you tell them it's about ½ of 1%. Raising the minimum wage would presumably benefit less than 1% of the working population, but it would most likely make it harder for young and inexperienced workers to get a job. It's already hard enough: the unemployment rate for those aged 16-19 is 13.1%, by far the highest unemployment rate for any age cohort. (The unemployment rate across all age groups today is a mere 3.9%.) Politicians should be lobbying to reduce or eliminate the minimum wage, not increase it. The best way for someone to make more than minimum wage is to first get a job, any job, at any wage, then work your way up. Economic growth is a function of two major factors: growth in the number of people working, and growth in the output of those working (i.e., the productivity of labor). For most of the current business cycle expansion, which has been the weakest post-war expansion on record, productivity has been unusually weak, averaging about 1% per year. Prior to the Great Recession, productivity averaged over 2% per year. Productivity and jobs growth are in turn a function of investment, and investment—no surprise—has been unusually weak for the past 9 years, despite the fact that corporate profits have been unusually strong. Investment is the seed corn of future growth, since investment builds new businesses, creates new jobs, and gives workers the advanced tools necessary to increase their productivity. Something has been holding back the economy, and it might be as simple as a general unwillingness on the part of business to expand and invest in new plant and equipment. Confidence is key, and confidence has, until fairly recently, been low. Risk aversion, by the same token, has been rather high. If the economy is going to grow by 3% or more, productivity is going to have to increase (and maybe jobs growth, but not necessarily), and that means that investment is going to have to increase. Increased investment is likely to follow from lower corporate tax rates, and from increased confidence and an increased willingness to take risk. Thanks to the bulk of Trump's policies, we have the essential ingredients for a stronger economy: lower tax rates on business and business investment, reduced regulatory burdens, and a more business-friendly climate in Washington. 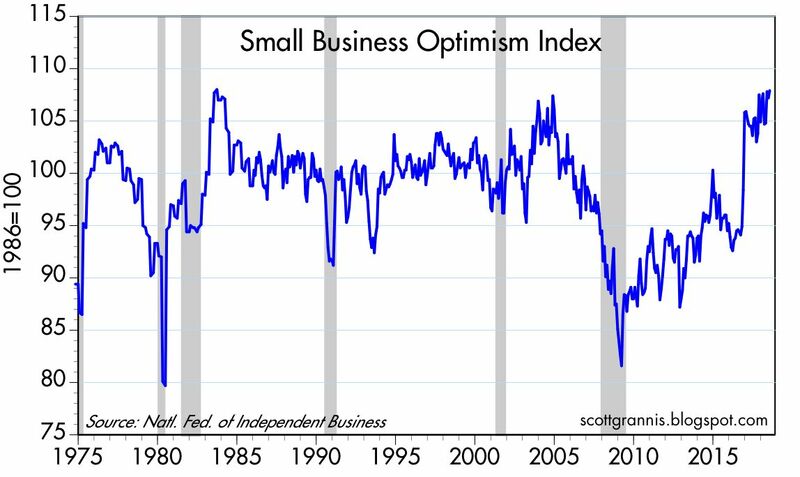 There are early indications that the economy is picking up steam (e.g., business investment is up in the past 18 months, and real yields are up), but it's still premature to declare victory. Unfortunately, things are never so straightforward. While we undoubtedly have the essential ingredients in place for a significant pickup in economic growth, we also have—from the same pro-growth Trump who advocated for lower tax and regulatory burdens—an escalation of tariffs, which suppress growth by making imports more expensive for everyone. I think Trump's ultimate objective is to reduce tariff barriers. I think he sees higher tariffs as a negotiating tool to eventually arrive at a reduced and even zero-tariff world. But for his negotiations to succeed, he has to convince our trading partners (particularly China) that he is willing to sacrifice some portion of US growth to achieve a result that would eventually be a win-win for all concerned. Suffice to say that this is a delicate balancing act. I'm optimistic he will succeed, but my confidence in that belief is not as strong as I would like it to be. In short, Trump's tariffs are, for the time being, a headwind to growth, while his other policies are a tailwind. I've been posting updates of Chart #1 for at least the past 5 years. It never ceases to amaze me that the prices of two different assets should be so highly correlated. Of course, gold and TIPS do share a few things in common: both offer promises/guarantees of some sort. Gold promises to maintain your purchasing power over time, and TIPS offer you a government-guaranteed real rate of interest. Both, in other words, offer a form of protection against inflation, and both can be considered "safe" ports in an economic and/or financial market storm. 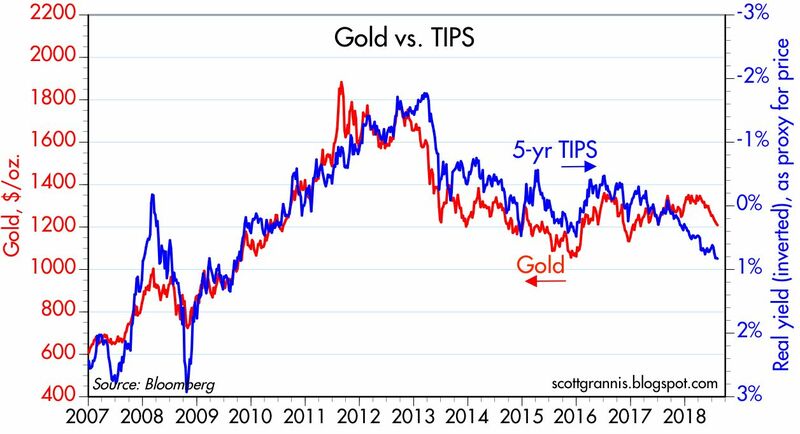 For the past year this chart has been suggesting that gold prices were lagging the decline in TIPS prices. Gold now appears to be "catching up." Awfully tempting to see gold prices move still lower. Why should these two asset prices tend to correlate so well? Gold and TIPS prices rose in the late 2000s as the economy crashed. A weaker economy made gold more attractive because many figured that monetary easing in response to significant economic weakness might spark a rise in inflation. And gold is a natural safe place to hide when there is economic and financial market chaos. TIPS rose in price as well, because there was strong demand for the guaranteed real yields that they paid when other asset prices were collapsing. For the past 5 years, gold and TIPS prices have been irregularly declining, because the market is coming to appreciate that the outlook for economic growth is improving, and that lessens the need for accommodative monetary policy and that in turn lessens the risk of an unexpected rise in inflation. Moreover, the returns on other assets have been very attractive of late, and that weakens demand for gold and TIPS because neither promise much in the way of return (gold pays nothing, and the real yield on TIPS is meager). Plus, there is just less need these days for the security and safety of either asset. And of course there is less demand for inflation hedges now that we have seen two decades of inflation averaging 2% or less, and now that the Fed is beginning to reverse its quantitative easing stance. 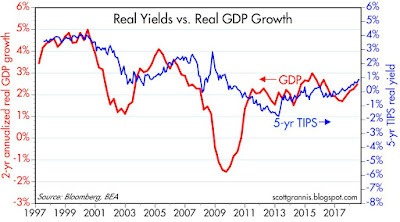 Chart #2 shows how real yields on TIPS do indeed track changes in economic growth fundamentals. 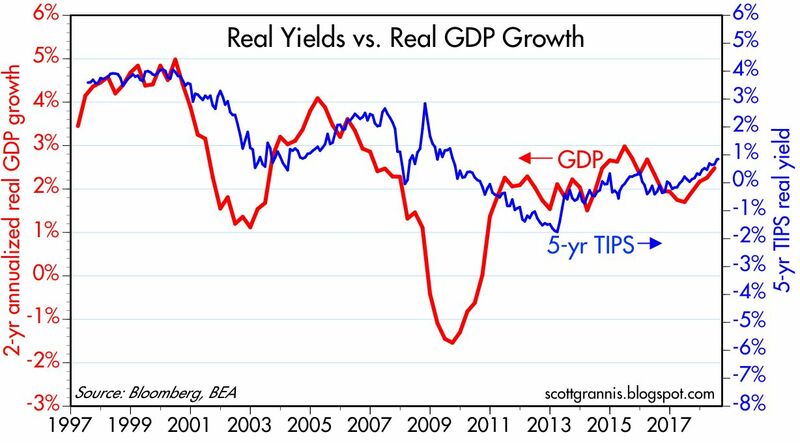 A very strong economy in the late 1990s saw very high real yields on TIPS, whereas the past decade of sub-par economic growth has seen very low real yields. Both growth and real yields have been moving higher in recent years. By now everyone knows that Apple's market cap has reached $1 trillion. 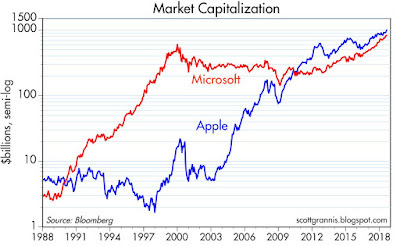 I offer the following chart for perspective on Apple's achievement. 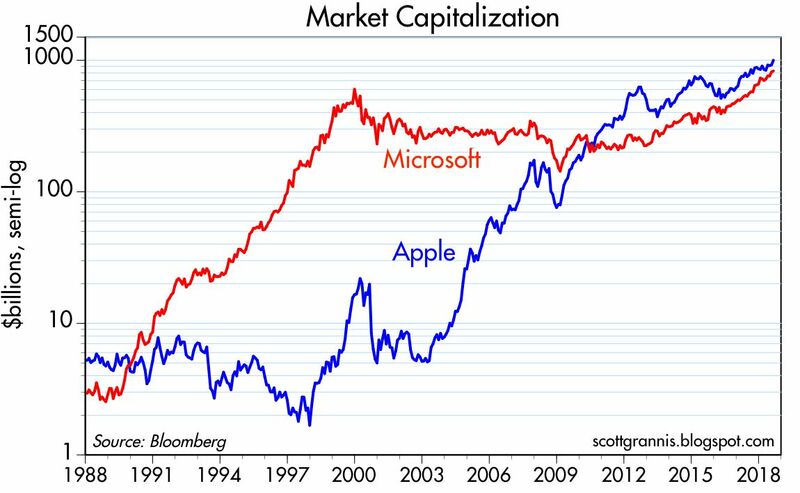 I've included Microsoft's market cap, since for many years it was assumed that personal computing was owned by Microsoft and that Apple was doomed. I've owned AAPL shares since 2003 (and still do), and have posted several times over the years on the virtues of Apple, beginning with this post in early 2009. It's a wonderful success story.